When I read about Wafa’s in New York, I knew I had to go there. I trust New York‘s food reviews more than any other in the entire world–much more than Yelp’s attention-deprived diatribes and certainly more than any place Time Out New York might recommend. You see, both Yelp and Time Out are largely indiscriminate. New York (Adam Platt, Robin Raisfield, and Rob Patronite, to be exact) clearly has taste, which is why I rely on it for restaurant recommendations. Wafa’s, dishing Mediterranean and Lebanese cuisine, is a small place on Metropolitan Avenue in Forest Hills, Queens. Humble and unassuming, the flavor is big at Wafa’s. BYOB is its policy, but luckily there’s a liquor store directly next door. We started with some grape leaves and babaganoush. 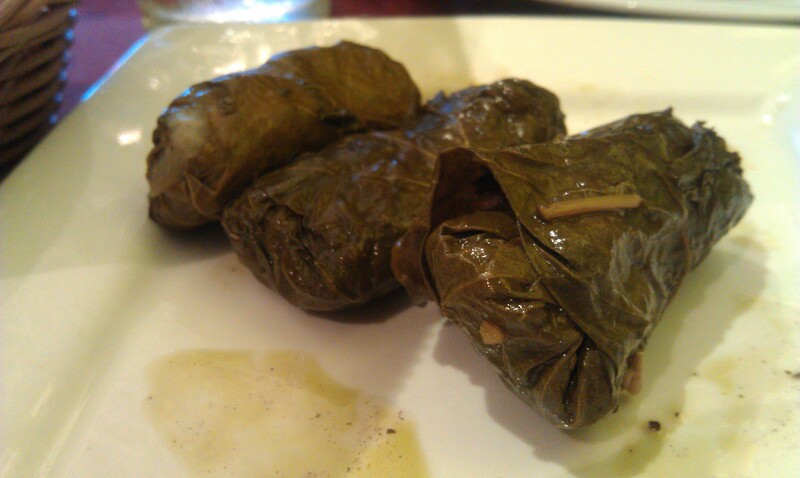 Stuffed with rice, onion, parsley, and tomatoes, the grape leaves were average in taste. They lacked something–flavor might be it–but were served in generous proportions. They gave us at least six grape leaves for our order. 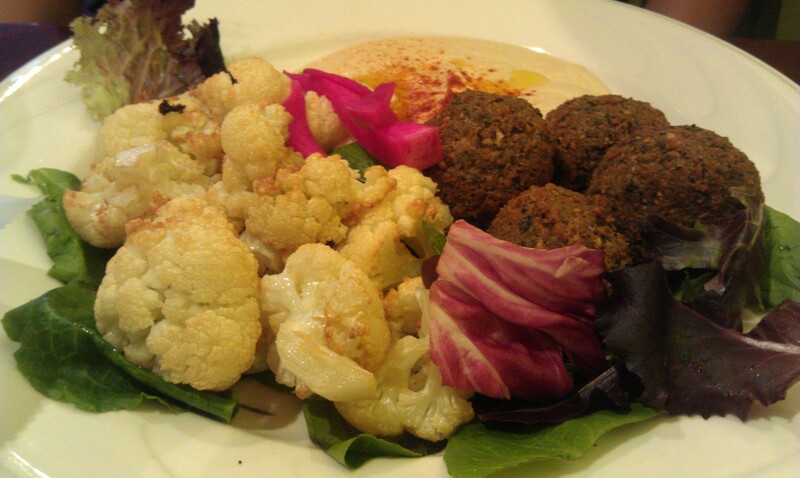 Though they paled in comparison to the babaganoush, we devoured them. The babaganoush stole the show, however. Prepared with grilled eggplant, the babaganoush had a rich, smokey flavor. 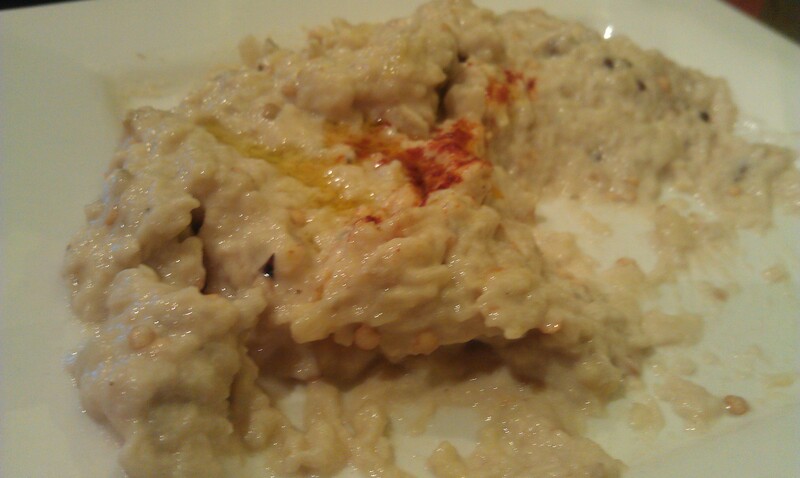 Small chunks of eggplant dotted this otherwise very creamy dip. Moustache is one of my favorite Middle Eastern restaurants, but I am certain that Wafa’s babaganoush gives it a run for its money. 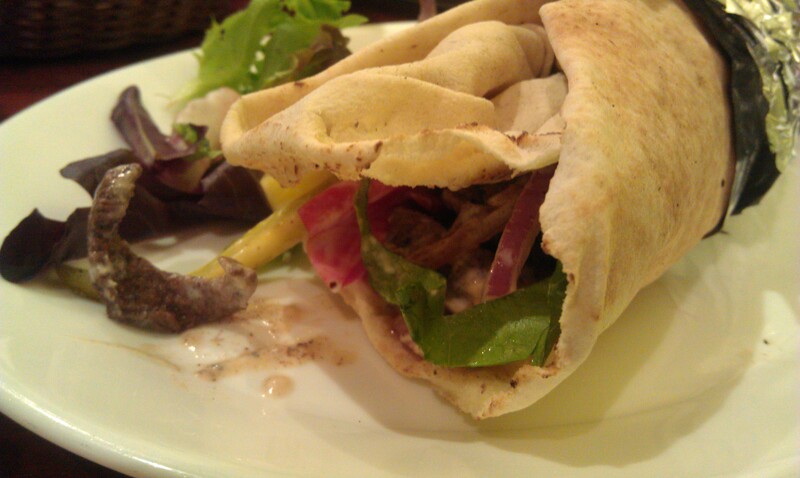 As an entree, I ordered the Lamb Shawerma sandwich, which was chock full of tangy lamb, turnips, onion, lettuce, tomato, and tzatziki sauce stuffed into a light pita bread. It was pretty delicious, but I still think that babaganoush was better. 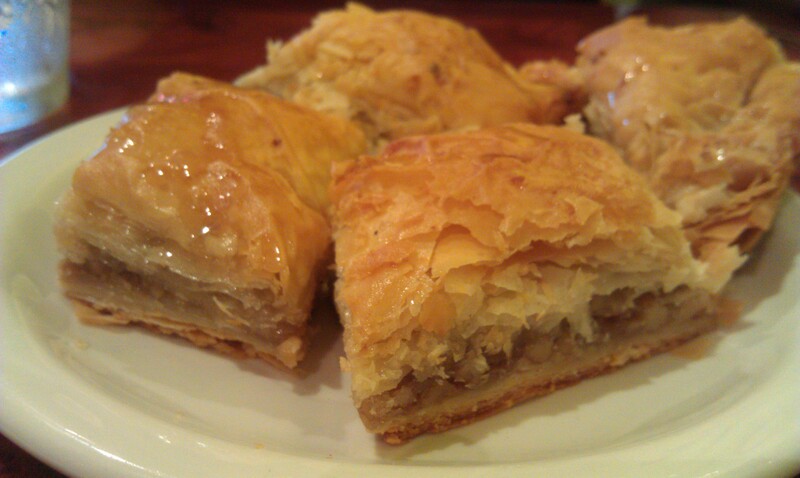 Last but certainly not least, we sampled the baklava for dessert. When I say this is one of the best desserts I’ve ever had, I mean it. The crisp filo dough was layered with walnut/pistachio filling (I thought it was walnuts, but MDP suggested pistachios). Lightly drizzled honey covered the top layer. It was to-die-for–and nearly impossible to eat with a fork. We both ended up eating the baklava with our hands. You don’t need to take my advice about anything I write here on this blog. However. I implore you: ORDER THE BABAGANOUSH AND BAKLAVA. You won’t be sorry. One day later, I’m still lost in a Middle Eastern/Mediterranean reverie that is Wafa’s. Try it out some time.